I despise wasting food. Sure, I’ve done it a million and one times, but every time I have to do it I cringe. I think, How come we couldn’t have eaten this or used this before it went moldy/rancid/curdled? I know I’m not alone. Most American families throw away as much as 25% of the food they buy. * Shocking, right? 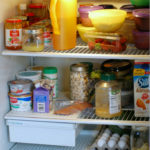 If you get a little organized and go through your fridge or freezer often enough you don’t have to waste that much food. 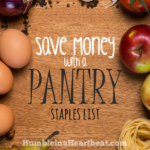 It can save you a ton of money on groceries each month, and it can save you time driving to and from the grocery store a few times a month. Right now I probably throw away 75% less food than I did a little more than a year ago. The biggest way we have sent less food to the garbage is just by taking stock of what we have on hand in lieu of shopping for more groceries. I periodically use a fridge and freezer inventory sheet to help me remember the perishable foods we have, when they will go bad, and how much of them we need to use up. You can put off going grocery shopping for a couple days and sometimes even more, because you can use the food in your fridge and freezer to make a meal plan. 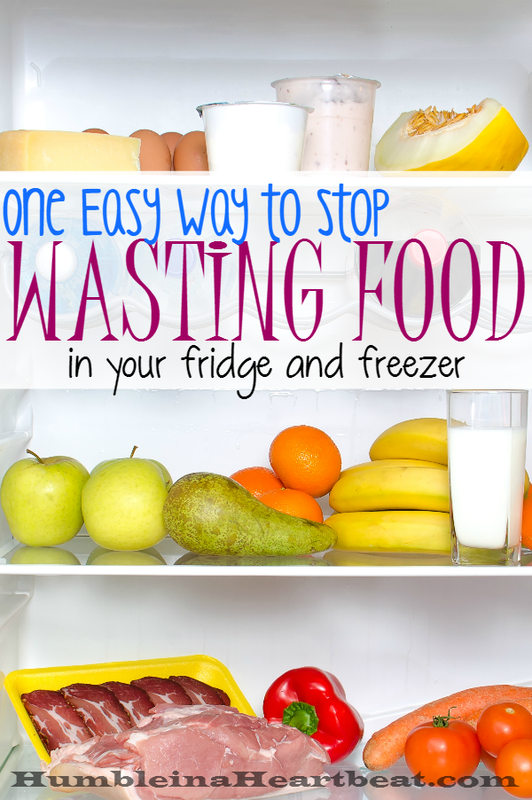 Instead of throwing away food, you will use up the food you have. If I buy an ingredient for a specific meal and we don’t finish using it up in that meal, I will try my best to find another way to use it so it doesn’t go bad. 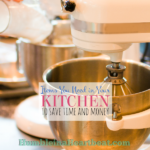 To discover leftovers that should be eaten or put into the freezer to eat some other time. To take note of foods you may need to stock up on (if you keep track with a pantry staples list what you normally eat). It will help you organize your fridge or freezer every so often. 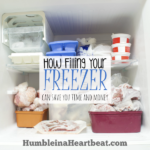 You get the opportunity to clean your fridge or freezer while you’re doing the inventory. As often as once a week — and at the very least once a month — I will go through my fridge and take note of everything we have. If I have a little time, I will take everything out of the fridge. I might use this as an opportunity to wipe down the shelves if they look particularly dirty. I usually go shelf by shelf and I just remove the contents, list them on my fridge inventory sheet, and then I put them back if they are still good to eat. On the fridge inventory sheet, I list the date at the top, then for each item I list the quantity and best by date. You might have to guess about the best by date, but doing this will help you use up the foods that should probably be eaten first. Listing the quantity is important so you can use it all up. After I have my fridge inventory all done, I glance through it and see if there is anything I can make for dinner the next few nights with some of these foods, making sure to try and use the highest priority foods (those with best by dates coming up soon) first. Instead of going through the freezer once a week, you can do it once a month or even every 3 months if that works better for you. If a food looks like it has freezer burn or if the date on the package has passed, I sometimes throw it out depending on the food. If it has been 6 months, I will normally just toss it regardless. I like to use the food in the freezer within 3 months, because after this the quality starts to go down. I did my latest fridge and freezer inventory last Monday, and I was able to come up with 7 dinners without stepping foot into the grocery store. I did go shopping the next day to get a few fruits, eggs, and milk for breakfast and snacks. I only spent $11 for groceries for a week because I used up what we had on hand. Normally when I go shopping, I spend at least $55 and sometimes as much as $70. For me, spending a little time doing this inventory 1-3 times a month is a huge benefit to our budget. I only spent 1 hour doing both inventories — not bad for a savings of $44! I’m guessing $50 is the least amount you could save in one month on your groceries if you start doing this regularly. 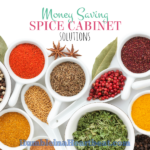 On the high side, you might be able to save $150, especially if you buy a lot of food on sale and put it in the freezer to preserve. 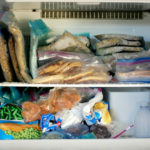 Taking inventory of your perishable foods will help you to waste less food and spend less on your groceries each month. All it takes is a little time and creativity on your part! 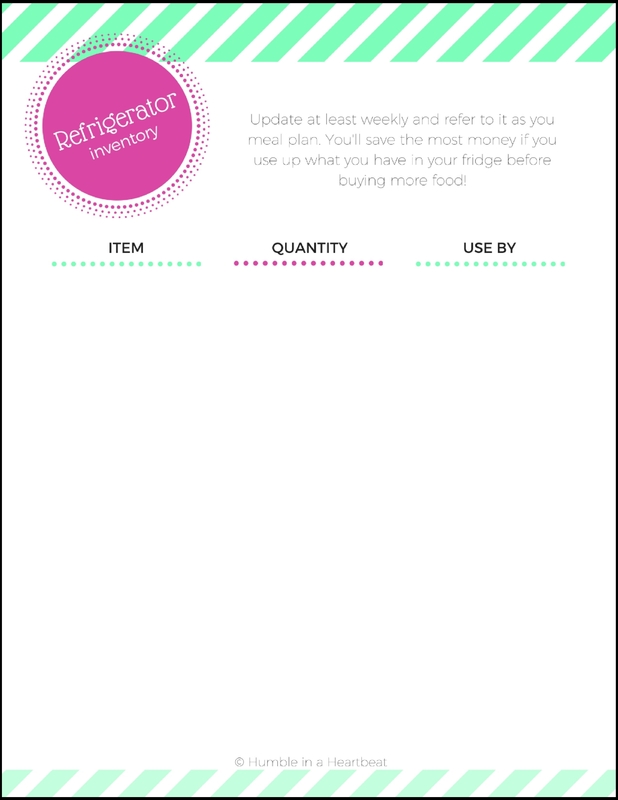 You can download a fridge inventory right here and a freezer inventory right here.